The clinical sciences department in the College of Veterinary Medicine has announced David Biller as the recipient of the 2017 Award of Excellence in Resident Mentoring. 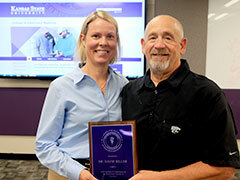 Biller, who is a professor and section head of radiology, was presented with a plaque and $1,000 award. "The department of clinical sciences believes mentoring is critical to the growth of individual members and the department as a whole," said Elizabeth Davis, interim department head. "Faculty mentors provide the foundation for development of the next generation of leading veterinary medical educators. The award allows our clinical residents and interns to honor faculty mentors who embody both the letter and spirit of mentoring. We congratulate Dr. Biller on this well-deserved award." Biller was nominated by Pax Harness and Katie Tucker-Mohl, who wrote, "Dr. Biller is deliberate with his demonstrated commitment to fostering intellectual, creative, scholarly and professional growth of mentees so they may function effectively with measurable success in the organization, resulting in career growth and personal development." Biller earned his Doctor of Veterinary Medicine at Auburn University in 1980. In 2013, he was presented with the Wilford S. Bailey Distinguished Alumni Award by his alma mater. He was an intern at the New Haven Hospital in New Haven, Connecticut, from 1980 to 1981. He was on the Doctor of Veterinary Medicine medical staff at South Shore, Missouri, from 1981 to 1984. Biller performed a residency in radiology at Ohio State University from 1984 to 1987. He was an assistant professor at the University of Wisconsin from 1987 to 1991, an adjunct professor at the University of Prince Edward Island, and an assistant professor at Ohio State University from 1991 to 1994. Since then he has been at Kansas State University.